The Firm Foods T-Shirt keeps you looking fresh and cool all day with its simple design and clean fit. This shirt is perfect for fitness buffs who are fans of the products from the brand Firm Foods, the brand that is dedicated to delivering premium quality health supplements at customer-friendly prices! 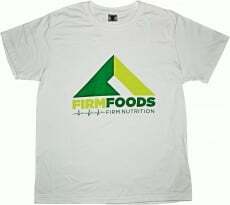 The Firm Foods T-Shirt is made available in white, making it the perfect shirt for warm, summery days, or as an extra shirt that you can wear at the gym or after a long day at the gym. This shirt features the Firm Foods logo in front, making it a good piece of clothing to wear if you want others to know all about this brand. Firm Foods boasts of a comprehensive lineup of health and fitness supplements, such as protein powders, herb extracts, vitamin and mineral supplements, performance-boosting solutions, and much more! Show your love to the Firm Foods brand by getting your very own Firm Foods T-Shirt today! Have a question about T-shirt? What is it, what does it do, how and when to use or something else? Ask us.